At Ebco Metal Finishing (EMF) it is our commitment to provide customers with quality metal finishing and hot-dip galvanizing services at competitive prices. To achieve this, we maintain a highly skilled and efficient workforce, an in-house chemist and laboratory, and state-of-the-art facilities. 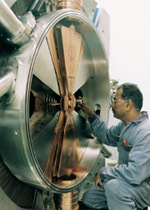 EMF has over 45 years of experience in metal finishing. Our completed projects range from large outdoor structures to very fine decorative coatings to close tolerance finishes for the high-tech industries. As a result, EMF understands the broad spectrum of metal fabrication and machining processes. We maintain our knowledge of the most current practices by regularly sending our staff to courses and seminars. Our two plants totalling over 40,000 square feet are the largest facilities in Western Canada.This allows us to accommodate high volume production capacities and handle very large parts. Automatic hoists and barrel lines provide maximum efficiency and turn around speeds. Our galvanizing tanks accept parts up to 40 feet in length in a single dip (longer with double dip). Copyright©1999-2000 Ebco Metal Finishing LP.